Contained within the Historical Maps, 1639 to 1949, Atlas of Canada map series, is a reproduction of an 1888 map compiled by Surveys and Mapping Branch of Energy Mines and Resources [now Natural Resources Canada] to commemorate the 1973 centenary of the RCMP. The map shows stations and patrol routes in the North-West Territories during 1888. The area covered corresponds to present-day southeastern Alberta and southern Saskatchewan. 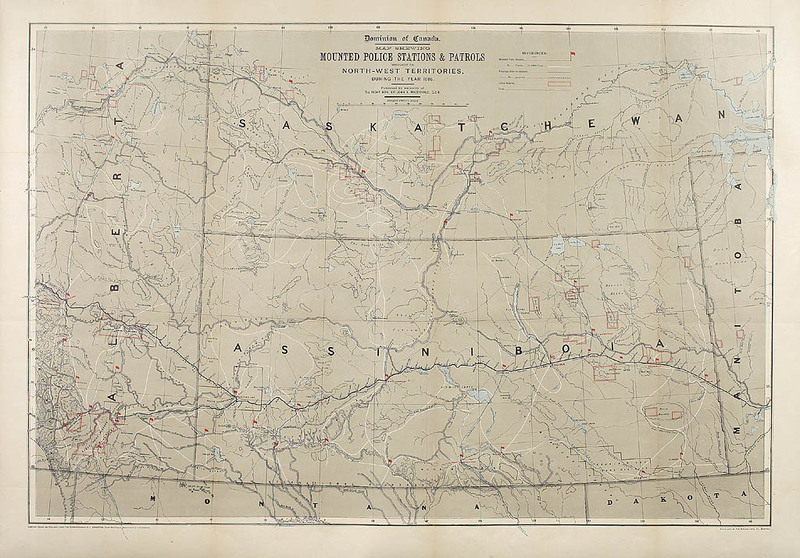 The map has a great deal of information about Indian lands, showing treaty areas, Indian reserves, and giving populations on the reserves. Contained within the Historical Maps, 1639 to 1949, Atlas of Canada is a reproduction of the An Accurate Map of Canada with the Adjacent Countries. It was produced by Richard William Seale and published in London by J. Hinton. Contained within the Historical Maps, 1639 to 1949, Atlas of Canada map series, is a reproduction of the original Amerique Septentrionale map by Nicolas Sanson and was published in 1695 by Pierre Mortier in Amsterdam. Contained within the Historical Maps, 1639 to 1949, Atlas of Canada map series, is a reproduction of the original 1639 America Septentrionalis map by the Dutch map making family, Hondius. Contained within the Historical Maps, 1639 to 1949, Atlas of Canada map series, is a reproduction of one of the bird's eye view sketches of cities which were very popular in the late 19th century. In this case, it is a black-and-white sketch drawn by Herm. Brosius and originally published by Chicago Litho. Co. As of 1876, Ottawa consisted of only part of Centretown, Byward, and Sandy Hill. The view lists dozens of major buildings at the time. It also has a sketch of the three buildings of Parliament. Of interest, all streets and railway lines are named.